A name whose origins are forever obscured, buried beneath the shifting sands of time. Where’s the UPPER Powerline Road? Beautiful blue skies again! Wishing you a wonderful walking day! 15 more minutes till Dr. Perky time. I see a small bunch of cows in the distance ignoring you – they are itty bitty from this distance. Looks like the stop sign was well utilized as a target. Folks I haven’t said much since that mega flower picture garnered several thousand bytes of input but……. The last entry should have mentioned the weather tower gizmo in lewistown – sorry bout that. Watch your step…those low powerlines carry a punch. Especialy not after your swimming trip. JOhn…dr. percky is Candices coffee…not sure the time thing…Mecication probably .. she is a little crazy. I agree with Katzien….To infinity and beyond. That would be shocking, aren’t you kinda crazy to be so in touch with Dr. Perky? Great photo of the landscape. I guess I am surpried that I do not see more windmills and the like for power production. However; I would not want to ruin such a serene area with the such. Mountains are getting closer and closer! More Hutterites on this route! Read and See! I swear… the place Matt ate and met the Hutterite ladies in the other picture. I think they are in the 1st picture on this webpage!! Jeff and gang tell me if I’m way off base.. but the young girl and the older lady seem to be here in the group picture! yes, craig, it does look like the two ladies, in that group picture! yes..I see and I believe! Yup. That looks like Lori in the purple, and Anna two to the left in the brown. Maybe because it’s the only road around with power lines? What an amazing shot…it just goes on and on forever. Also how the hell do you walk 30 miles in one day? Today my friends and I walked about 14 miles (the length of Manhattan plus a few lateral detours) and we were absolutely exhausted by the end of it. How do you walk twice that amount and then get up the next day and do it again? Stamina. He didn’t start out doing 30 miles a day, seems he built up to it. And now it’s just average for him. Because all he’s been doing for the past 4 months is justwalkin’ . Dorinda, how did you estimate 30 mpd? I’m trying to figure out exactly how many miles Matt has walked to date, but I’m apparently not as savvy with Google maps as some of you are. 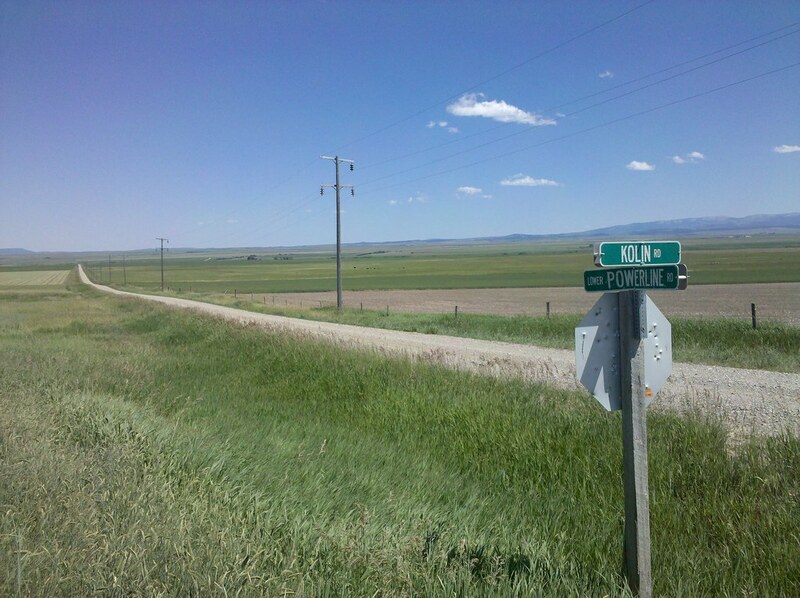 Today, it looks like he’s near Belt, MT, which is about 2,175 walking miles from Point A (whoo-hoo! Matt!!). Not counting the days he rested, Matt has been walking 110 days, which would average almost 20 mpd. Of course, I’m doing some guesstimates on my end, but I’m curious how you came up with 30 mpd? Is this information being posted in a comment section somewhere else? I’m aware of the Google red-line in the UR corner, but still would like some help in figuring this out? Thanks. BTW – 20 mpd or 30 mpd, either way it’s all impressive. Angelica – awesome trek!! Isn’t long distance great. I am not sure how often you do this mileage..but I assure you that from everyday experience…the trek gets easier as you body gets used to the stresses of the walk, the time and environment. DO it for a few weeks/months in a row and I guarentee (or your money back) that it gets easier. Geese..matt is young, well trained…and only what, say 925 miles or less to go…..I am sure there is some – almost there too. ehehehehe Jeff, I know u r correct, but “it’s calling me”. I so wanna do the route. Ohh you know sooo much about this dear Jeffy, will you walk across the US next? Who are you and where did you come from and why are you picking on just Jeff? You must have a thing for him. gabsch..to be exact I have walked 129,000 miles so far in the last 30 years. 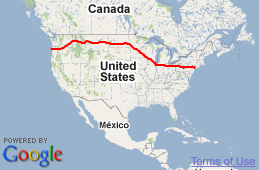 I don’t have the time to do the three thousand miles and the time it takes 6-9 months. But if you care to join me one day…bring it on. It’s your call. Like I said before a chuck is a chuck.